The Jumpshot MT is super-easy to drive and get familiar with – all you have to do is plug in the included battery and switch on the radio and car. It’s that easy! To drive the truck, simply pick up the controller with your left hand, put your left index finger into the trigger area, and then put your right hand on the steering wheel – it’s as natural as driving a real car! Turn the wheel to go left and right, and gently pull on the trigger with your left index finger to go forwards. To stop the Jumpshot MT, gently push away from you with your left index finger - hold it there to go into reverse. It takes seconds to get used to this easy operation, and in no time at all you’ll be ripping off jaw-dropping, big-air jumps and stunts! The Jumpshot MT drives and performs fantastic right out of the box, however if you want to, it's easy and quick to adjust plenty of settings, exactly like a real monster truck! 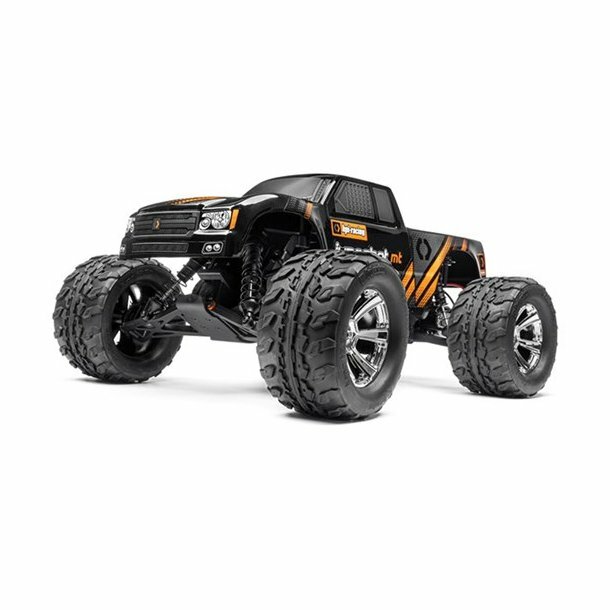 Adjustments such as ride height, shock angle and more are merely a turn away with your fingers or a wrench if you want to dive under the hood – HPI make it easy to be your own monster truck mechanic AND driver! More complex adjustments such as camber settings can be done with option parts you can get from your RC hobby shop.